Spire.PDF for .NET is a professional PDF component applied to create, read, write, edit and handle PDF documents without any external dependencies within .NET application. Using Spire.PDF for .NET, you can implement rich capabilities to generate PDF documents from scratch or process existing PDF documents entirely through C#/VB code without installing Adobe Acrobat. 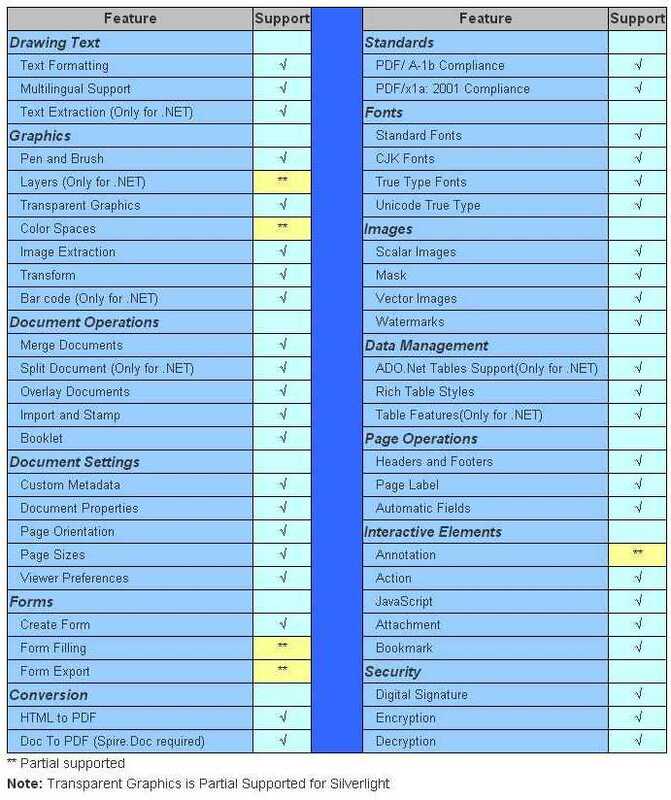 Many features can be supported by this PDF component, such as security setting (including digital signature), PDF text/image/attachment extract, PDF merge/split, metadata update, section and paragraph optimizing, graph/image drawing and inserting, table creation and processing, and importing data etc. Besides, Spire.PDF for .NET can be applied to easily convert HTML, Text, and Image to PDF with high fidelity. With an incredible wealth of features and affordable price, you can quickly download Spire.PDF for .NET and effortlessly install it in their system. Thereafter, you can reference Spire.Pdf.dll directly in your own .NET application to manipulate PDF documents. Spire.PDF for .NET supports converting HTML (HTM, ASPX), Text, and Image etc. to PDF documents with efficient performance. Developers can transform these image formats, such JPG, PNG, BMP, TIF, GIF and ICO to PDF format. Furthermore, along with Spire.Doc for .NET, developers can convert Word (Doc/Docx), Excel(Xls/Xlsx), RTF and XML to PDF. Spire.PDF for .NET offers the facility to merge/split PDF documents and overlay documents. That is to say, users can overlay pages from different PDF documents one over another. Meanwhile, Spire.PDF for .NET can provide import and stamp feature, booklet feature and form filling which can help users read value from form fields and populate a database. Spire.PDF for .NET can protect PDF documents by setting passwords and digital signature. User password and owner password can determine the encrypted PDF documents readability, modifiability, printability and other selective restrictions. Meanwhile, digital signature, as a more effective method, can be applied to safeguard and authenticate PDF documents. Spire.PDF for .NET can be used to extract images, text, pages and attachments from a PDF document with great speed and accuracy. Document information can be set with Spire.PDF for .NET including custom metadata, document properties, page orientation, and page size. Wherein, document properties consist of document restrictions (printing, document assembly, page extraction, comment etc. allowed or not) and document description about file title, author, subject, keywords and so on. By using Spire.PDF for.NET, viewer preferences can be set with position, title display, resize, page mode and print scaling etc. Spire.PDF for .NET can support text formatting, multilingual support, text alignment etc. It provides pen and brush to draw shape elements, text, images into PDF. Layers, transparent graphics, color space and barcode creation can render PDF. Developers have a great option to add scalar/vector images and mask and place them in designated location.